Helping your team to fly through.. WELCOME. HOW WOULD YOU LIKE YOUR TEAM TO REALLY FLY? Have you ever wondered why a group of geese on the ground is called a gaggle, but when they are in flight they are known as a skein? Maybe it’s because, on the ground, they are all over the place, bumping into each other, talking over each other and all going for the same piece of food at the same time, whereas in the air they move in glorious formation, understanding their role in each position, with one honking at a time and with the understanding that together they can travel so much further than if they went alone. 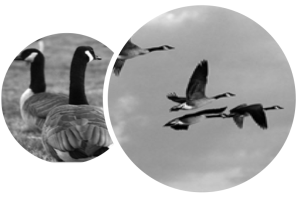 Our passion is to help you and your team fly like the geese in their skein and to that end we develop inspirational programmes to get you airborne. We cannot be successful without dealing with the real issues and calling it as we (and others) see it. We work hard to get people to see others’ points of view and connect with a higher intent. When this happens, it is quite magical and the commercial results rapidly follow. VALUE 3: iTS ABOUT YOU! Ultimately it’s about you and what you want to achieve and how we can help you achieve your goals. It’s personal, we understand that, which is why everything we do, whether before, during or after our projects, has you and your success at its heart. We only want to work with committed and like-minded people, whose word means more than any contract or agreement. We only do things which we know will have a beneficial affect for you and your team. We passionately care about you, your team and getting the very best result for you. We pride ourselves on listening far beyond the norm. We know our customers love the space this creates. We listen with no judgement and no ego. Even after the project finishes, we are still on hand to support you and share the journey. We always put your needs first. We do a deep diagnosis before creating your unique solution. We cannot write the prescription before we have carried out the diagnosis, which we do in person, in depth and with breadth across both commercial and cultural (emotional) aspects of your business. Our clients love that our experience is diverse, global, commercial and proven at a senior level. We have walked in your shoes. 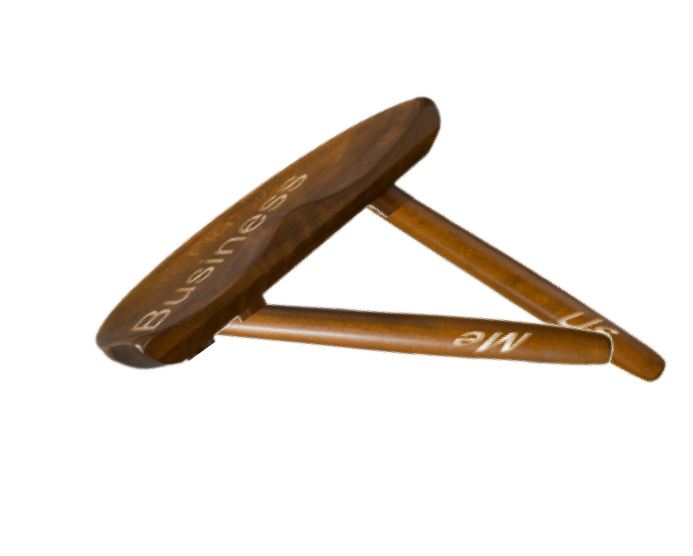 …miss one element out and the reality of business transformation simply falls over. We know exquisite teamwork comes when all three elements are in place and that for a team to reach peak performance, three fundamental elements need to be addressed: ‘ME’, ‘US’ and ‘IT’. 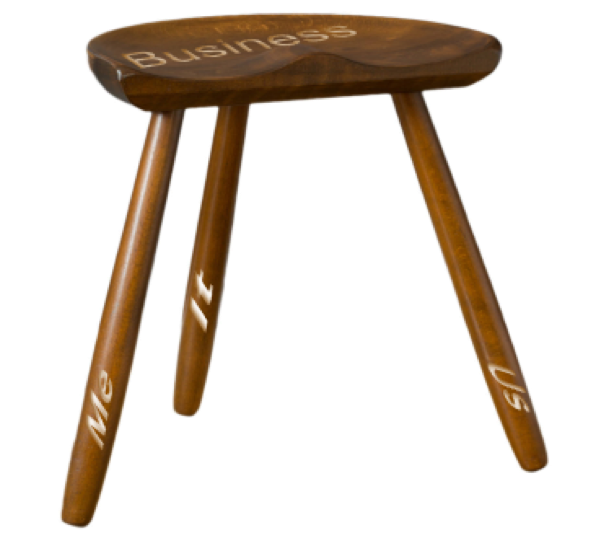 Like the three legs on a milk stool, miss one element out and the reality of business transformation simply falls over. What is our own truth? We often put the biggest barriers in our own way! How do we create our own daily reality? How do we settle our busy minds to give clarity and confidence? Team leaders who have completed our programmes report a strong feeling of calm confidence, together with greater clarity, a sharper focus and more control. They know their truth. They feel more confident at work and enjoy their jobs more than ever before. Teams are built on a foundation of trust. Trust comes from an abundance of credibility and reliability within a safe and secure environment and is often destroyed by any presence of self-interest or ego. In an environment built on trust, teams can celebrate, embrace and leverage diversity of style and work in a culture of continuous learning. Our clients often tell us they have great plans but these fail at the execution stage. True traction comes with clarity, alignment and a unifying culture that is lived by everyone at all times. We align teams using our unique DiamondEDGE® framework which includes; a Vision for the team, Values and behaviours, the Essence or Intent (higher purpose), Strategic priorities together with role clarity and expectations, action plan or pointers.